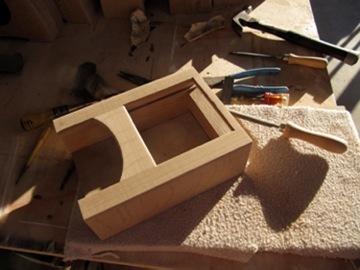 Every detail from hand-selecting the rough lumber to the finish waxing is done by me personally. After you’ve perused the available clock models, you can start to put together the perfect clock for your home or gift for someone special. You can chose the model, size, face, wood, finish and type of movement to make the clock truly your own unique creation. Depending on the clock you had in mind, lead times can vary from available right now, to 3 to 12 weeks or longer. I always make extra clocks in a particular run, so I can sometimes fill some orders immediately. Be sure to check Clocks Available Now to see what I may have in stock. The best way for me to get the right clock for you is to communicate by e-mail. 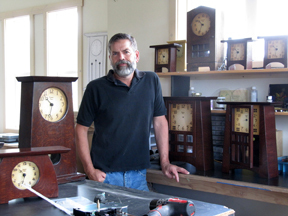 I can answer any questions you may have and give you an idea of when I might have the clock ready for you. I can understand the apprehension of spending a sizable amount of money on something sight unseen. I can offer emailed photos of the finished clock before you decide on the purchase. If after you receive your clock you are not completely satisfied, you may return it within 30 days for a full refund, or exchange it for a different model or finish for the cost of the shipping.